The backyard of the house on Phillips Street was littered with branches. From big, thick limbs to long, curved twigs, debris was everywhere. “It looked like a tornado came through,” said Judy Floyd, who lives here with her husband, Curtis. It wasn’t a tornado, but it was just as destructive. Freezing rain swept into Monterey, Tennessee, just before dawn on February 21. It coated the area with up to an inch of ice. Trees couldn’t handle the weight. It sounded like a series of gunshots as limbs began to crack and fall. Debris from downed trees and limbs covered Judy’s yard. “They were poppin’ and droppin’,” Judy said. Curtis has a broken hip, sustained in a fall about a week before the ice storm. Judy is a grandmother with arthritis. When the sun came up and she saw the amount of devastation, the thought of beginning the cleanup process was overwhelming. “It would have taken me at least six weeks to clear all this,” she said. Hope arrived when a Samaritan’s Purse assessor knocked on her door and asked if she needed assistance. 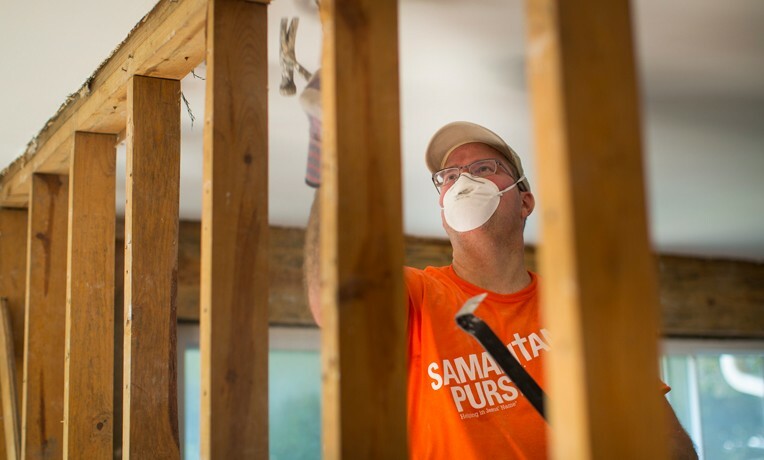 Samaritan’s Purse staff members arrived in Monterey the day after the storm hit to assess the damage and see if we could help. “As we rode through, it seemed that every house had damage to it. Every house had limbs down,” said Bruce Poss, a program manager with our U.S. Disaster Relief ministry. 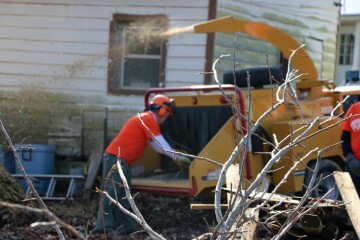 A wood chipper quickly reduces limbs to pulp. We deployed the next day, sending a disaster relief unit, staff, and equipment from our North Carolina headquarters. The call went out for workers to help meet the needs of storm victims. We established our base at the First Baptist Church of Monterey, and both requests for help and volunteers began to pour in. We worked in Monterey for over four weeks. When we finished the response on March 23, 329 volunteers had given their time to complete 346 jobs, mostly for debris cleanup. Through the witnesses in word and deed from the Samaritan’s Purse staff and volunteers and chaplains from the Billy Graham Evangelistic Association Rapid Response team, 37 people came to faith in Jesus Christ. “It’s amazing to see how God changed lives in this quiet little town,” Blevins said. The completed jobs included the house on Phillips Street. 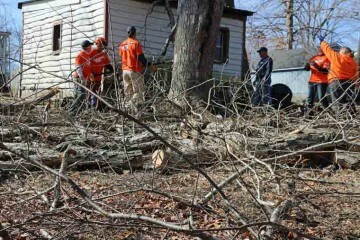 The Samaritan’s Purse team used a couple of chainsaws, a wood chipper, and a crew of willing helpers to clean the yard in an afternoon, saving the Floyd family weeks of work. 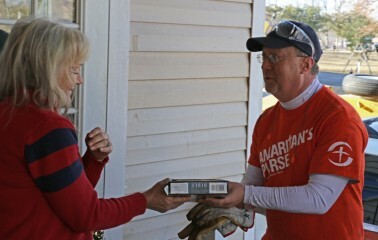 The team presented Judy with a Bible when the work was finished. The volunteers working in her yard included Eleanor Kent, who came from Round Rock, Texas, and Lindsey Phillips, a life-long resident of Monterey. Eleanor first worked with Samaritan’s Purse in November 2013, when nearby Austin was hit by catastrophic flooding. She’s been looking for an opportunity to serve again since then. “If I could do this every day, all of my life, I would,” she said. She’s a stay-at-home mom with two daughters, 15 and 9. Her husband was able to watch them this week, so she hopped on a plane. Lindsey (right) is volunteering with Samaritan’s Purse because she wants to show her neighbors the love of Christ. Lindsey is a member of First Baptist Church of Monterey and wanted to help her neighbors recover from the storm. She began working in the kitchen as soon as Samaritan’s Purse arrived, preparing meals for the workers and cleaning up with her husband at the end of the day. 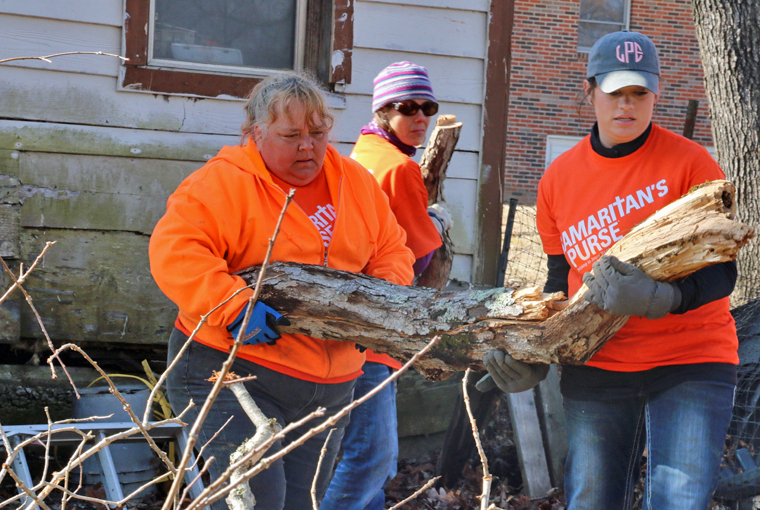 On her first day going out with a team, she hauled limbs and raked at the Floyd home. She even learned how to use a chainsaw. Praying with homeowners reinforces the message that God is with them through the storm. Even though her muscles were sore, Lindsey planned to be back out the next day, working with volunteers from throughout the country to be the hands and feet of Jesus to her neighbors.